Join us for a night of fun, food, and famiglia!! In addition to the great Italian food for dinner we will be conducting a reverse raffle, grand prize $3,000. Additional prizes will be raffled off throughout the evening. This is one of our most popular events and is sure to sell out quickly. Only one hundred $100 chance tickets will be sold. 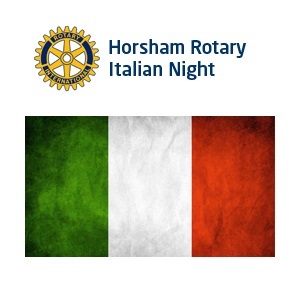 Please contact a Horsham Rotarian or contact us at horshamrotary@yahoo.com to reserve your tickets. Dinner only tickets are also available for $40. This is a BYOB event.